A urine test for detecting Bath Salts. It’s an instant urine test that detects the MDVP compound which is the active ingredient found in Bath Salts. 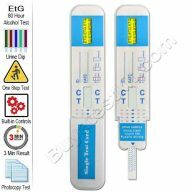 A simple test to check for abuse by testing their urine. Compared to a lab test this product could check twenty-five people for the same price as one. Bath Salts Instant Drug Test is a one-step Methylenedioxypyrovalerone (MDPV) instant test which yields a positive result when the concentration of Methylenedioxypyrovalerone in urine exceeds 1,000ng/mL. Bath Salts was developed to subvert law enforcement and drug testing agencies and promoted as a legal high. Parents have become very concerned that their child can easily buy these products from off the internet and then take it without their knowledge. As a result, we released our Bath Salts Instant Drug Test kit to enable parents to test their teens and put a stop to this horrible drug. Test results in just a few minutes. Bath salts are a designer drug, also promoted as plant food or research chemicals. It is sold mainly in head shops and on the Internet, and at other retail locations. It’s chemical name is Methylenedioxypyrovalerone or MDPV. The technical term for bath salts is substituted cathinone. Substituted cathinone is synthetic, concentrated version of the stimulant chemical in Khat. Khat is a plant grown in East Africa and the Middle East. It has a stimulant effect on the user and has proven to be dangerous. The white crystals resemble legal bathing salts, thus the name of bath salts. In 2009 and 2010 there was a significant rise in the abuse of synthetic cathinone, initially in the United Kingdom and the rest of Europe, and subsequently in the US and Canada. Established as one of the leading ingredients for bath salts among other synthetic stimulants like Mephedrone, Methylone, Butylone and Methedrone, MDPV started appearing around 2004 and popularized as a club drug, often used with a combination with alcohol, GHB, cannabis, and other abused drugs. Its desired effects are euphoria, alertness, talkativeness, and sexual arousal. There is currently no prescribed use for the synthetic stimulants. While artificial stimulants appear to affect users in ways similar to amphetamines, ecstasy and cocaine, reports concerning aggression, tachycardia, paranoia, and suicide suggest that they may be more acutely toxic. These adverse effects have resulted in increased visits to the ER and hospitalization. In October 2011, the DEA announced an emergency ban on MDPV, Methylone, and Mephedrone, making testing for these substances more vital than ever. Collect a small sample of urine from the donor. 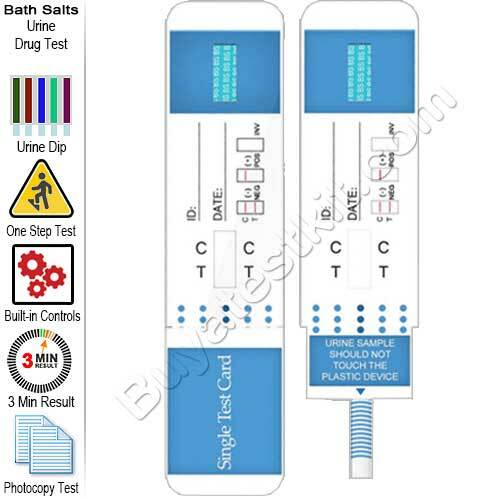 Included in each box of Bath Salts Instant Drug Test is a datasheet which provides technical information and how to use. Use the links below to download a drug test form and datasheet.